The EL3681 EtherCAT Terminal enables measurement of currents and voltages in a wide input range. The measuring ranges are switched automatically, as usual in advanced digital multimeters. For current measurements, two current paths are available, one of which is a high-current path for up to 10 A. The current and the voltage measurement facility can be used for DC and AC. The alternating parameters are output as true RMS values. The measurement readings can be read and processed with EtherCAT. 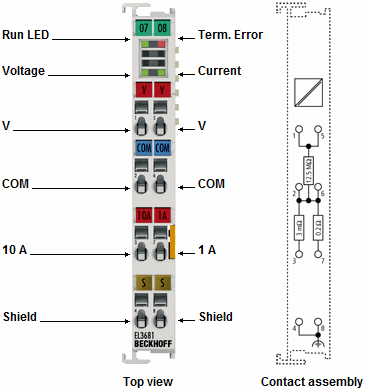 At the same time, the EL3681 enables the measuring type and range to be set via the bus. Excellent interference immunity is achieved through the fully electrically isolated design of the electronic measuring system and the dual-slope conversion system. High precision and simple, high-impedance measurement from 300 mV to 300 V allow the EtherCAT Terminal to be used like a modern digital multimeter. In measuring applications in particular, the voltage to be expected is often not yet known during the planning phase. Automatic adjustment of the measurement range simplifies use and reduces stock levels. The selected measuring type and overload are indicated by LEDs.